For the period of Armenia under direct Iranian rule during the early modern and late modern era (Eastern Armenia), prior to being ceded to Russia, see Iranian Armenia (1502–1828). a. ^ The Kingdom of Armenia is abolished by Shapur I; the country is governed by the Sasanian princes until 299.
b. ^ Armenia is partitioned between the Romans and the Sasanians; Western Armenia falls under Byzantine rule, and Eastern Armenia under Sasanian rule. c. ^ The Kingdom of Armenia is once and for all abolished by Bahram V, who appoints Veh Mihr Shapur as marzban of the country, thus starting the "Marzbanate period". 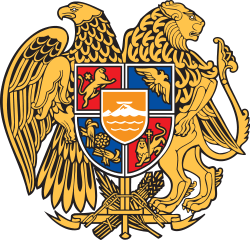 Sasanian Armenia, also known as Persian Armenia (Armenian: Պարսկահայաստան – Parskahayastan), refers to the periods that Armenia (Middle Persian: 𐭠𐭫𐭬𐭭𐭩 – Armin) was under the suzerainty of the Sasanian Empire. In 428, Bahram V (r. 420–438) abolished the Kingdom of Armenia, and appointed Veh Mihr Shapur as marzban (governor of a frontier province, "margrave") of the country, which was the start of a new era in Armenia, known in Armenian historiography as the Marzpanate period (Armenian: Մարզպանական Հայաստան – Marzpanakan Hayastan), a period when marzbans, nominated by the Sasanian King, governed the eastern part of Armenia, as opposed to the Byzantine Armenia which was ruled by several princes, and later governors, under Byzantine suzerainty. The Marzpanate period ended with the Arab conquest of Armenia in the 7th century, when the Principality of Armenia was established. An estimated three million Armenians were under the influence of the Sasanian marzpans during this period. The marzban was invested with supreme power, even imposing death sentences; but he could not interfere with the age-long privileges of the Armenian nakharars. The country as a whole enjoyed considerable autonomy. The office of hazarapet, corresponding to that of Minister of the Interior, public works and finance, was mostly entrusted to an Armenian, while the post of Sparapet (commander-in-chief) was only entrusted to an Armenian. Each nakharar had his own army, according to the extent of his domain. The "National Cavalry" or "Royal force" was under the Commander-in-chief. The tax collectors were all Armenians. The courts of justice and the schools were directed by the Armenian clergy. Several times, an Armenian nakharar became Marzpan, as did Vahan Mamikonian in 485 after a period of rebellion against the Iranians. Three times during the Marzpanic period, Iranian kings launched persecutions against Christianity in Armenia. The Iranians had tolerated the invention of the Armenian alphabet and the founding of schools, thinking these would encourage the spiritual separation of Armenia from the Byzantines, but on the contrary, the new cultural movement among the Armenians proved to be conducive to closer relations with Byzantium. Christianity became the state religion of Armenia in 301. 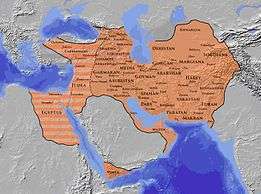 In 367 Armenia was divided between Sasanian Iran and the Roman Empire. The former established control in Eastern Armenia after the fall of the Arshakuni Armenian kingdom in 428. In 465, Adhur Gushnasp was appointed by the Sasanian emperor Peroz I (r. 459–484) as the marzban of Armenia, replacing Adhur Hormizd. In 475, the Mamikonian princess Shushanik, was murdered by her husband Prince Varsken, a recent convert to Zoroastrianism, because she refused to convert and wanted to stay Christian. Varsken was then executed by Vakhtang I, king of Iberia. Peroz I, eager to avenge Varsken, sent his general Shapur Mihran to Iberia. Vakhtang then appealed to the Huns and the Armenian nobles, citing solidarity between Christians. After carefully weighing the decision, the Mamikonian prince Vahan Mamikonian agreed to revolt against the Sasanians. He defeated and killed Adhur Gushnasp, and thereafter declared Sahak II Bagratuni as the new marzban. He also kept repelling several Sasanian counter-attacks. In 482, Shapur Mihran began to become a big threat to the security of Iberia, which made Vakhtang request Armenian aid. Vahan and Sahak shortly arrived to Iberia at the head of a big army, but were defeated in Akesga, where Sahak was killed. Vahan fled with the remnants of the Armenian army into the mountains, where he led guerrilla actions against the Sasanians, while Shapur Mihran managed to regain control of Armenia. However, Shapur Mihran was shortly ordered to return to the Sasanian capital of Ctesiphon. Vahan quickly used the opportunity to regain control of Armenia. In the spring of 484, however, Shapur Mihran returned as the head of an new army and forced Vahan to flee to refuge near the Byzantine frontier, at Tao and Taron. During the same period, the Sasanian noble Zarmihr Karen from the Karenid family, was successful in another campaign against the Armenians, and managed to capture several of them, including noblemen from the Kamsarakan family. Zarmihr shortly delivered the Armenian captives to Shapur Mihran, who delivered them to Izad Gushnasp, promising the Armenian captives to make Peroz spare them. However, an unexpected event changed the course of events: the death of the Sasanian king Peroz I in 484 in war against the Hephthalites, causing the withdrawal of the Sasanians in Armenia and recovery of Dvin and Vagharshapat. Struggling to suppress the revolt of his brother Zarir, Peroz's successor, Balash (r. 484-488), needed the help of the Armenians: in exchange for military support, he agreed to sign the Nvarsak Treaty, which granted religious freedom to the Christians and the prohibition of Zoroastrianism in Armenia, including much greater autonomy for the nakharar. Vahan was also recognized as sparapet and the property of the Mamikonian family and its allies were returned. Between 515-516, several Hunnic tribes kept making incursions into Armenia—the Armenian nobleman Mjej I Gnuni then decided to organize a counter-attack, where he successfully managed to repel them. As a reward, Kavadh I appointed him as the marzban of Armenia in 518. During this governorship, Mjej maintained religious peace. In 527, he repelled several other Hunnic invasions. In 548, he was succeeded by Gushnasp Bahram. Chihor-Vishnasp, a member of the Suren family and a relative of Khosrow I himself, was in 564 appointed as marzban. During this period, the Armenian aristocracy was split between two parties, the national one which was headed by a member of the Mamikonian family, and a pro-Sasanian one, which was headed by a member of the Siunia family. Chihor Vishnasp not only harshly treated the Christian Armenians who were suspected of secretly siding with the Byzantines, but also did the same with the rest of the Christian Armenian population. Claiming to exploit on the command of the king, he persecuted the Christian Armenians and even built a fire-temple in Dvin. These actions soon resulted in a massive uprising in late 571 or early 572, which was led by Vardan III Mamikonian. On 23 February 572, the Armenian rebels seized Dvin, and had Chihor-Vishnasp killed. Sasanian king Yazdegerd II began to view Christianity in the Northern lands as a political threat to the cohesiveness of the Iranian empire. The dispute appears to be based on Iranian military considerations of the time given that according to Acts 2:9 in the Acts of the Apostles there were Persians, Parthians and Medes (all Iranian tribes) among the very first new Christian converts at Pentecost and Christianity has had a long history in Iran as a minority religion, dating back to the very early years of the faith. Nevertheless, the conversion to Christianity by Armenians in the North was of particular concern to Yazdegerd II. After a successful invasion of the Eastern Roman Empire, Yazdegerd began summoning Armenian nobles to Ctesiphon and reconverted them to Zoroastrianism (a faith many Armenians shared with Iranians prior to Christianity). This upset the Armenian population, and under the leadership of Vardan Mamikonian an army of 66,000 Armenians rebelled against the Sasanian empire. Yazdegerd quickly subdued the rebellion at the Battle of Avarayr. The military success of the Iranians ensured that Armenia would remain part of the Sasanian empire for centuries to come. However, Armenian objections did not end until the Nvarsak Treaty, which guaranteed Armenia more freedom and freedom of religion (Christianity) under Sasanian rule. 252/3-272 Hormizd I Sasanian prince, nominated by his father Shapur I. 272-299 Narseh Sasanian prince, nominated by his brother Hormizd I. 428-442 Veh Mihr Shapur Iranian grandee, nominated by Bahram V.
442-451 Vasak, prince of Syunik Armenian nobleman, nominated by Yazdgerd II. 451-465 Adhur Hormizd (in Armenian sources: Adrormizd) Iranian grandee, nominated by Yazdgerd II. 465-481 Adhur Gushnasp (in Armenian sources: Arderveshnasp) Iranian grandee, nominated by Peroz I. 481-482 Sahak II Bagratuni Armenian nobleman, elected by the rebellious Armenian nobles. Killed at the Battle of Akesga. 482-482 Shapur Mihran Iranian military occupation. 482-483 Vahan I Mamikonian Head of provisional government. 483-483 Zarmihr Karen Iranian military occupation. 483-484 Shapur of Ray Iranian grandee, nominated by Peroz I.
Cyril Toumanoff suggests a marzpan named Andigan for the same period. 484-505/510 Vahan I Mamikonian (2nd term) Armenian nobleman, nominated by Peroz I. 505-509 or 510-514 Vard Mamikonian ("Vard the Patrician") Brother of Vahan I, recognized as marzpan by Kavadh I. 11 years Several Iranian marzpans perses According to Samuel of Ani : "After the patrician Vard, brother of Vahan, Iranian marzpans governed Armenia for 11 years ... The government of Armenia passed then to Mjej of the Gnuni family, who exercised it for 30 years". 518-548 Mjej I Gnuni Mentioned by Cyril Toumanoff and Gérard Dédéyan, but not included by René Grousset. 572-573 Vardan III Mamikonian Leader of anti-Iranian rebellion. 572-574 Golon Mihran Iranian general tasked by Khosrau I with subduing the revolt. Cyril Toumanoff substitutes him and Vardan with Vardan-Gushnasp. 573-577 Vardan III Mamikonian Under Byzantine protectorate. For the same period, Krikor Jacob Basmadjian a Cyril Toumanoff have Philip, prince of Syunik. 577-580 Tamkhosrau Iranian grandee, nominated by Khosrau I. 581-582/588 Pahlav Iranian grandee, nominated by Hormizd IV. 582/588-588/589 Frahat Iranian grandee, nominated by Hormizd IV. 588/589-590 Hrartin (Fravardin) Iranian grandee, nominated by Hormizd IV. 590-591 Musel II Mamikonian Installed by the Byzantines. 592-605 Vindatakan These five marzpans are mentioned by Cyril Toumanoff. 604-611 or 616 Smbat IV Bagratuni Christian Settipani records him as marzpan from 599 to 607. He is not mentioned as marzpan by Toumanoff. René Grousset holds that Khosrau II named him marzpan following his victories in Hyrcania, ca. 604, and adds that he possibly continued in office until his death in 616-617. However, he also mentions three other marzpans over the same period (see following). 613-613 Parshenazdat Iranian grandee, nominated by Khosrau II. 616-619 Namdar-Gushnasp Iranian grandee, nominated by Khosrau II. 619-624 Shahraplakan (Sarablagas) Iranian grandee, nominated by Khosrau II. 624-627 Rotshvehan Iranian grandee, nominated by Khosrau II. 627-628 A large part of Armenia reverted to Byzantine control. ca. 628 Varaztirots II Bagratuni Armenian nobleman, named marzpan by Kavadh II for the portions of Armenia remaining under Iranian rule. Following the onset of the Muslim conquest of Iran, Varaztirots aligned himself with the Byzantines. 630-635 Mjej II Gnuni Armenian nobleman, named governor of Armenia by the Byzantine emperor Heraclius. 635-638 David Saharuni Armenian nobleman, he murdered Mjej and proclaimed himself governor. He was recognized by Heraclius, who named him kouropalates and ishkhan of Armenia. ↑ Yeremyan, Suren. «Մարզպանական Հայաստան» (Marzpan Armenia). Soviet Armenian Encyclopedia. vol. vii. Yerevan: Armenian Academy of Sciences, 1981, pp. 313-315. ↑ (Grousset 1947, p. 213). 1 2 3 4 Chaumont 1986, pp. 418–438. 1 2 Greatrex & Lieu 2002, p. 138. 1 2 3 4 5 (Toumanoff 1990, pp. 506–507). ↑ (Settipani 2006, p. 133, n.4). ↑ (Dédéyan 2007, p. 195). 1 2 3 4 5 (Grousset 1947, pp. 242–247). ↑ (Settipani 2006, pp. 330–334). ↑ (Grousset 1947, p. 264). ↑ (Grousset 1947, p. 272). Basmadjian, Krikor Jacob (1914). "Chronologie de l'histoire d'Arménie". Revue de l’Orient chrétien (in French). IX (XIX): 293–294. Chaumont, M. L. (1986). "ARMENIA AND IRAN ii. The pre-Islamic period". Encyclopaedia Iranica, Vol. II, Fasc. 4. pp. 418–438. Grousset, René (1947). Histoire de l’Arménie des origines à 1071 (in French). Paris: Payot. Toumanoff, Cyrille (1990). "Vice-rois iraniens (Marzpans) d'Arménie". Les dynasties de la Caucasie chrétienne de l'Antiquité jusqu'au xixe siècle : Tables généalogiques et chronologiques (in French). Rome. pp. 506–507. Settipani, Christian (2006). Continuité des élites à Byzance durant les siècles obscurs. Les princes caucasiens et l'Empire du vie au ixe siècle (in French). Paris: de Boccard. ISBN 978-2-7018-0226-8. Dédéyan, Gérard (2007). Histoire du peuple arménien (in French). Toulouse: Éd. Privat. ISBN 978-2-7089-6874-5. Kurdoghlian, Mihran; Hayots, Badmoutioun; Hador, A (1994), Armenian History (in Armenian), I, Athens, Greece, pp. 56–57, 61–62 . Babayan, Yuri, Historical province of the Greater Armenia . Bournoutian, George A, A History of the Armenian People, II, p. 1, Prior to the third century AD, Iran had more influence on Armenia's culture than any of its other neighbours. Intermarriage among the Iranian and Armenian nobility was common .